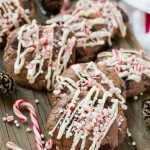 These peppermint bark cookies are a decadent double chocolate delight topped with white chocolate and crushed candy canes. 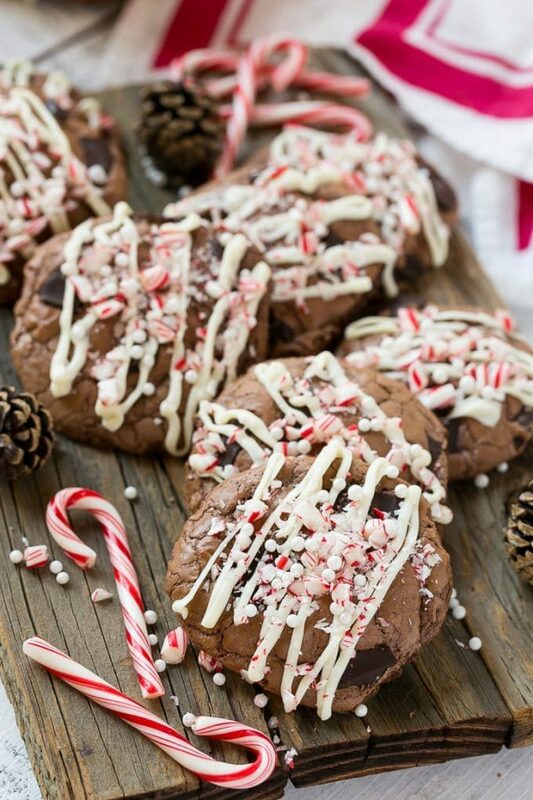 These chocolate peppermint cookies are a must bake for the holidays! Peppermint bark is great on its own, but when you take those flavors and add them to cookies, you end up with an extraordinary holiday treat that’s festive and delicious. In December of 2006 I got together with a few friends of mine to do some holiday baking. We each brought a couple of ingredients and a few recipes and we spent the afternoon making an assortment of holiday treats to give to our friends and families. Little did we know a tradition was born that day! We now get together every year on a Saturday in December to bake dozens of cookies and other sweet delights. Over time our group has grown with the kids we now have and new friends we’ve added along the way. I have happily assumed the role as holiday baking party hostess and today I’m sharing my tips for the perfect baking party and one of our favorite recipes for peppermint bark cookies. What exactly is a holiday baking party? In my case, we pick 3-5 recipes and make double or triple batches of each one. At the end of the day we split up the treats and everyone takes home enough goodies to make gift trays. When we first started our baking get-togethers we didn’t have children – now that the kids are in the picture we put them in charge of the cookie decorating! Over the years I’ve learned what works best to make sure that everyone has a great time and takes home plenty of cookies. Choose your recipes wisely – it’s nice to pick a variety of cookie flavors, shapes and sizes. You also want to carefully read the recipes ahead of time to make sure you have all the right tools and ingredients. I recommend choosing at least one no-bake option like fudge so that you can make it on the stove while you’re waiting for the cookies to be done in the oven. Have plenty of drinks and savory snacks on hand. People will nibble on baking ingredients like chocolate chips or sample the finished cookies and it’s nice to have a little something salty to go with the sweet. It doesn’t have to be fancy, I usually put out vegetables and dip, cheese and crackers and a bowl of trail mix. If you’re doing cookie decorating with kids it is so much easier to have those cookies pre-baked and ready to go for when your guests arrive. The kids are typically so excited to decorate that it’s hard for them to wait through the whole cookie baking process. Ask your guests to bring containers to transport their treats home. Now that we’ve talked about the preparation and clean up for the party it’s time to talk about cookies! These peppermint bark cookies are a twist on the classic candy and they’re very simple to make. 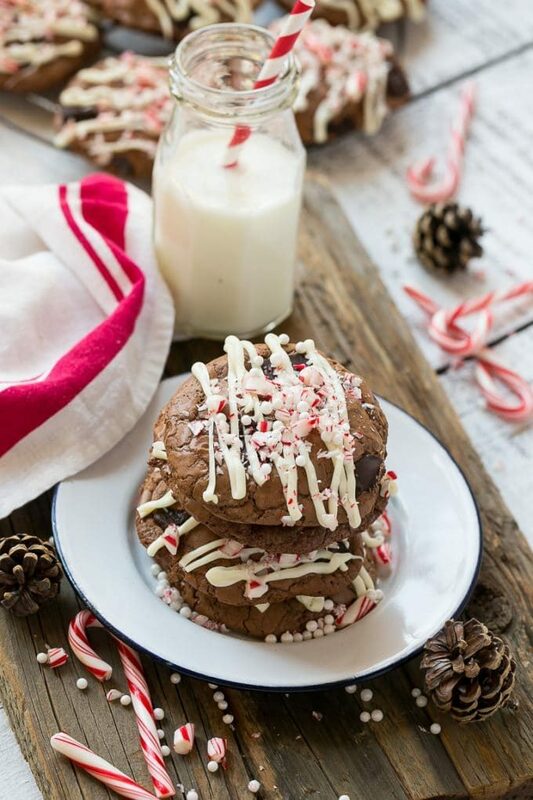 A double chocolate cookie gets topped with a drizzle of white chocolate, crushed candy canes and sprinkles. These cookies are definitely for chocolate lovers, there’s over a pound of chocolate in each batch. You can easily double or triple this recipe if you’re baking for a crowd. The cookies are almost brownie like in texture, and the rich flavor pairs perfectly with the sweet white chocolate and peppermint candy canes. 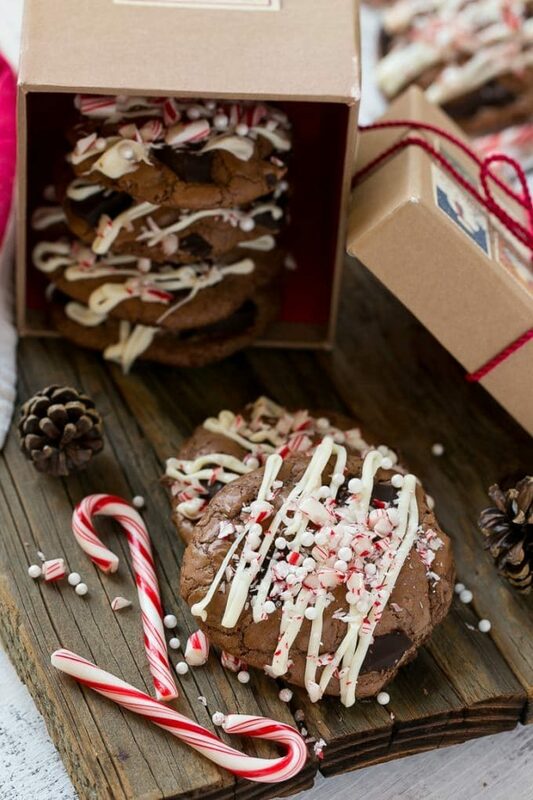 A decadent double chocolate cookie topped with white chocolate and crushed candy canes. Preheat the oven to 350 degrees. Heat the 8 ounces of semisweet chocolate and butter in a bowl in the microwave at 30 second increments, stirring between each, until just melted - be careful not to burn the chocolate! In a mixing bowl, beat the eggs, brown sugar, and vanilla extract on high speed until light and fluffy. Reduce the speed to low; beat in the melted chocolate. Mix in the flour mixture until just combined. Stir in chocolate chunks. Dough will be soft and thin; this is normal. Drop heaping tablespoons of dough 3 inches apart onto baking sheets lined with parchment. Bake until cookies are shiny and crackly yet soft in centers, 12 to 15 minutes. Cool on baking sheet for 10 minutes then transfer to a wire rack to cool completely. After the cookies have cooled melt the white chocolate in the microwave - heat at 30 second increments until just melted. Pour the chocolate into a resealable bag; snip the tip off one of the corners to make a piping bag. Squeeze the chocolate out of the bag onto the cookies in a decorative pattern then sprinkle evenly with candy canes and sprinkles. Let the cookies dry for at least one hour. This post was originally sponsored by P&G. This post was first published on November 18, 2015 and was updated with new content on October 18, 2017. These were so amazing! I will be making them again as soon as I can get the candy canes! These cookies are so festive! I love the combo of peppermint and chocolate….yum! 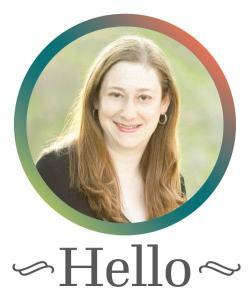 Feel free to use the pic, thanks! Peppermint bark is the best and now as a cookie! Even better! These cookies are gorgeous! They would be great for a Christmas party!